PASADENA, Calif. -- Jermaine Jones stared down at the pavement, the bitterness and disappointment seeping out of every pore. The United States had just fallen 3-2 in extra time to archrivals Mexico, and the spot in the Confederations Cup that seemed to be in the Americans' grasp just a few months ago was now gone thanks to Paul Aguilar's stunning volley with just two minutes of the match remaining. "It's bad," said Jones about the taste the defeat left. "For me it's the second time that I've lost a final against Mexico here in this stadium." He then recounted the game winner, from the U.S. clearance, to Raul Jimenez's hopeful pass and finally to Aguilar's searing drive, almost as if he thought about it hard enough he could go back in time and undo it. Eventually, there came grudging acceptance. "I think from 10 [tries] he makes one, and that was the one today," said Jones. The goal was the last swing of the game's emotional pendulum. 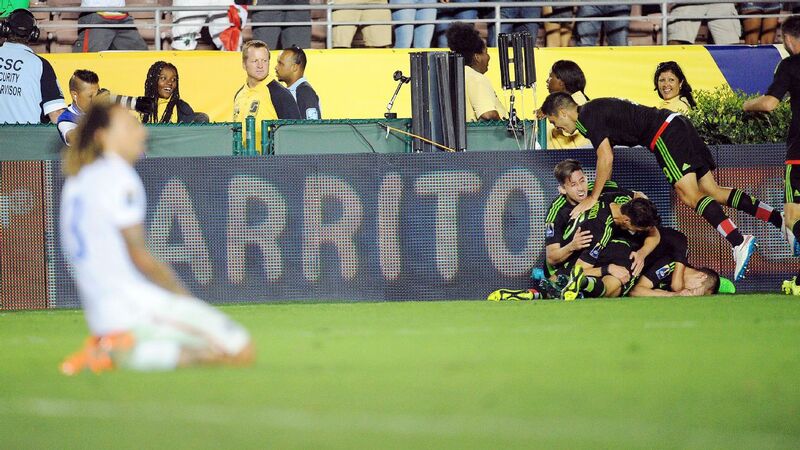 Javier Hernandez's 10th-minute opener seemed to put El Tri on their way, only for Geoff Cameron to pull one back. Mexico piled on the pressure in the second half, and finally made a breakthrough six minutes into extra time. The U.S. looked out of both gas and ideas, and then substitute Bobby Wood equalized in the 108th minute. "When Bobby scored that goal in extra time, it's a feeling you can't describe," said defender Matt Besler. "It was one of the best feelings I've had as a player." The U.S. thought it had the momentum. Instead, Aguilar snatched it away. "You play 118 minutes and it's 2-2, and Aguilar scores a great goal off a broken set piece," said midfielder Michael Bradley. "When you talk about the margins, this is it." That is indeed true, but margins reveal themselves in other ways, too. There is little to be done about technical margins in the context of a game. The players are what they are. Tactical margins are different, and in this department, Mexico interim manager Ricardo Ferretti got the better of U.S. counterpart Jurgen Klinsmann. U.S. manager Jurgen Klinsmann was caught off-guard by Mexico's use of three strikers. In fact, it wasn't so much a margin as a gulf. Ferretti's decision to field a three-man forward line featuring Hernandez, Oribe Peralta and Raul Jimenez caused problems for the U.S. back line all night. Bradley explained that the trio's movement effectively occupied the American back four, and forced them to play narrow. This allowed outside backs Miguel Layun and Aguilar to bomb forward and thus pin U.S. outside midfielders Gyasi Zardes and Jones deep into the American half. Aguilar in particular found himself in plenty of space, and assisted on Peralta's goal. That left the U.S. with a simple response: defend like crazy, and rely on counterattacks and set pieces. "In certain moments when we win the ball, we're able to move a little bit quicker, be a little bit sharper, give ourselves a little bit of pause in certain moments, play out on a more consistent basis," said Bradley. "That's how you tilt the bar back. I thought in moments we were able to do that well. I thought in moments when we won balls we were able to go forward quickly. Those were the moments we were dangerous." It's actually possible to control games like Saturday's, especially when the counterattacking side is able to wrangle a lead. But on most nights, and especially when the U.S. struggles to keep possession, it's a difficult and exhausting way to operate, particularly on a team littered with 30-somethings. While the U.S. was climbing the Eiger, Mexico was running downhill. "We ran a lot, we won a lot of balls, but we couldn't combine, we couldn't calm the game down enough," said Klinsmann. "There was a struggle in the second half where we could have done better." Going to his bench earlier would have helped, but after bringing in DeAndre Yedlin in the 76th minute, the U.S. manager didn't go to his bench again until eight minutes into extra time. It all points to a game in which little went right for the U.S. side, despite how close the score was. All of the preparation, the reliance on a veteran-heavy roster with experience in big games was undone by a tactical tidal wave, a slice of luck in Jimenez's pass, and then a sublime bit of skill from Aguilar. And now the bitterness will stick in the Americans' craw for quite a while.